Shakespeare Orange County launches Summerfest 2015 on June 13 with a classic radio comedy, followed by productions of Shakespeare’s Romeo and Juliet and As You Like It, Gilbert & Sullivan’s Pirates of Penzance, John Slade’s acclaimed I Sing Walt Whitman, an encore presentation of last season’s sold-out hit Trieu Tran (Unplugged), a new play reading, and a new Friday Night Film Series. The season officially kicks off June 13 with a Celebrity 1939 Radio Show and Gala. The script, an original from the days of live radio, will be performed by an all-star cast including Rene Auberjonois, John de Lancie, Seamus Deaver, Robert Hays, Kurtwood Smith, Nikki Soohoo, Joe Spano, Tamlyn Tomita, Trieu Tran, JoBeth Williams, and Stephanie Zimbalist. Romeo and Juliet opens July 11 and continues through August 1. Shakespeare’s most famous love story, set against the backdrop of two feuding families, becomes an opportunity to celebrate cultural diversity. Co-directors Walcutt and associate artistic director Mike Peebler have cast Trieu Tran and Nikki Soohoo as the star-crossed lovers. 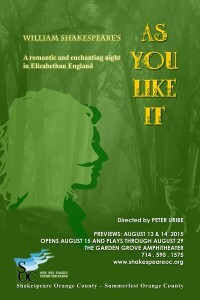 As You Like It, directed by Peter Uribe, moves Shakespeare’s beloved comedy about finding love and freedom from France to Elizabethan England. The production’s Renaissance Faire theme will engage audiences even before the show begins, with musicians performing in the amphitheatre’s park. In this beautiful play about the nature of love and the love of nature, Shakespeare creates one of his greatest female characters, the headstrong Rosalind. Banished from court, she heads into the Forest of Arden. Disguised as a man for safety, she will win the heart of the man she loves while matching wits with some of the Bard’s cleverest creations. SOC will also host a series of six Friday Night Films beginning with Franco Zeffirelli’s classic 1968 Romeo and Juliet on June 27. The remaining screenings will be held on the five Fridays in October. Those titles include Shakespeare in Love on October 2 and a special Halloween treat, Theatre of Blood starring Vincent Price, on October 30. The October 9, 16 and 23 titles are TBA. Films will be screened on the amphitheatre stage, beginning after dark at 8pm. I Sing Walt Whitman, John Slade’s one-man musical celebration of America’s great poet. Trieu Tran (Unplugged) is the concert version of Tran’s critically acclaimed Uncle Ho to Uncle Sam, which recounts his harrowing escape from Vietnam with his mother in 1975. A Staged Reading of For Bus, a new play by Chicago playwright Bill Hoffman. 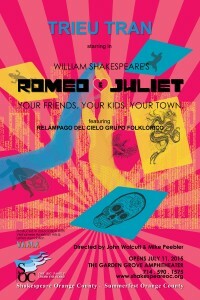 Tickets for all events are on sale now at www.shakespeareoc.org.